The first known use of the word “crazy” was in 1566. Two antonyms of the word crazy are realistic and reasonable. As someone who has a mental illness, I don’t like it when people use the term loosely to describe someone else. I often use the word to describe myself as some of the things I have done were crazy. However, I wasn’t not too acceptable when I heard the word used to describe myself or others. I think I would much rather someone say that I have a mental illness than to say I am crazy. However, at the same time, since the stigma for mental illnesses still runs rampant, maybe I should settle for the word crazy. I recently had a conversation with someone who has a mentally ill relative and she had told had told her kids not to use the word the word crazy because it wasn’t nice. Is the word not nice? So, today, I decided to look the word up that is used so often to describe so many things. I wanted to know if using the word crazy to describe someone with a mental illness is accurate. Well, they are! I could still argue that it is not a “nice word”. However, I guess I can’t blame people for using the word correctly. He’s been acting kind of crazy lately. 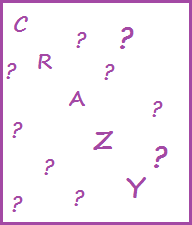 Well, after evaluating the word, I would have to say that I am definitely crazy. However, with this definition, I would have to argue that everyone is at least a little bit crazy! I know that everyone has at least done something that could be viewed as crazy. I decided a long time ago that I was not going to let it bother me when someone called me crazy, especially when they didn’t know I have a mental illness. However, it still does upset me sometimes when people use the word loosely and in a way to define someone. I guess I shouldn’t as I have already stated we are all a little crazy. This entry was posted in Uncategorized and tagged am i crazy, bipolar disorder, crazy, gone crazy, impractical, insane, mad, mental illness, merriam-webster, stigma, unusual. Bookmark the permalink. 10 Responses to Am I crazy? I’m trying to lighten up when I hear people say crazy in reference to things that are not people. I’ll use crazy lovingly to describe myself or my friends but it’s one of those words that is only good to use towards me if I trust you and I know you’re not trying to degrade me. Ah yes, nations separated by a common language again! As a Brit who’s lived in the US and Australia, I am often confused by the context in which the words “crazy” and “mad” are used. I agree with Henry G that there is a fondness and even wistfulness about “crazy” in the UK and Australia, and in that context I think we would all benefit from being a little more crazy sometimes! And “mad” in the US tends to mean angry, whereas in the UK and Australia I would be offended to have myself and my mental illness labelled as “mad” in a similar way to Raeyn’s reaction to “crazy”. I often try to explain to people that there’s a distinction between “mad” and “sad”, where a lot of mental illness lingers way too long, and yet this can also have the result of trivialising things. “If you’re just sad, then get out of the doldrums,” is something I hear over and over. At the end of the day, in society we’re always going to have our fair share of “sad”, “mad” and “crazy” people, so let’s accept that and help each other out. Those “perfect” people are so boring! Hey crazy is who I am and it took me 30 years to accept it. I have bad days and good ones but it’s who I am and my wife of 24 yrs and my 3 children wouldn’t want me any other way. Hell yeah I’m crazy!!!! I like that attitude and I am glad that your family has accepted you for who you are and love you. “I want crazy back. I want to use the word and shout it from the rooftops. I want to talk about my crazy good time at the beach, or the crazy delicious chicken salad I had for dinner or my crazy inability to drive past a Starbucks without stopping. I want the word back for all the good memories I have associated with it and the belief that new memories of that caliber are within my reach because I take care of myself and work hard to keep my disorder in check.